← Deanna Rodger’s ‘London Matter’ Is About to Hatch! Actress Sui-see Hung transforms into Granny Dumpling, taking us on an interactive culinary adventure through the shops of the high street, fetching ingredients along the way to prepare her signature dish! Yellow Earth Theatre‘s Granny Dumpling- Ba Banh It will be performed this Saturday only at 11.30am, 1.30pm & 3.30pm. 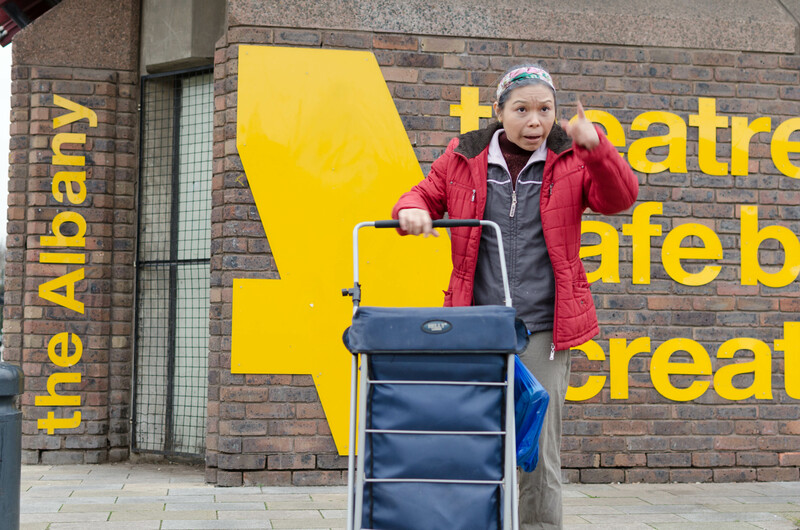 Written and directed by local writer Thanh Le Dang, Granny Dumpling follows the best dumpling maker in all of Deptford as she reveals her Vietnamese culinary secrets on a unique trip down Deptford High Street. Thanh Le Dang grew up in the Vietnamese Chinese community in Deptford and Granny Dumpling explores the idea of ‘home’. It’s about a lost old lady trying to establish a home for herself. With little social benefits, she makes a humble living doing what she knows; making dumplings to sell to the local community network in a street corner and to the local supermarket ‘Lai- Loi’ (this unofficial economy actually exists). The journey is about an old lady trying to find her way home without her only daughter as she talks to her ‘little dumplings’. This marks the second collaboration between Thanh and actress Sui-see Hung; they worked together previously on a piece called Theef that was developed for Yellow Earth’s new writing showcase Dim Sum Nights, and was voted audience favourite the night it was performed. Find out more about Granny Dumpling- Ba Banh It and book tickets here. Ticket price includes food at Deli X.